This was a really yummy lunch which sort of came about accidentally when I wanted to make a classic tuna and bean salad… but then realised I had no tuna left in the cupboard. I then thought I’d adapt it into a chorizo and bean salad… but then I realised the chorizo I’d left in the fridge had completely dried out and gone rock solid… back to square one. Having fallen at several hurdles I had a rummage around in the fridge to see what else I could find to salvage this lunch as I’d already opened several tins of beans. Eventually I had a random selection of things from the fridge all spread out on my kitchen work top and decided to just start chopping. I think what I came up with turned out to be way better than the original tuna and bean salad option! 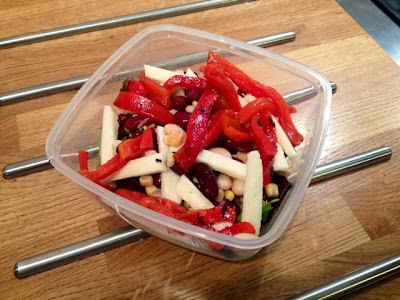 It’s rare you won’t find halloumi and/or feta in my fridge, we’re big fans of Greek cheese in my house as I’ve practically been brought up on the stuff, and the roasted red peppers were left over from a starter at the weekend. You could of course roast our own red peppers, 20 minutes under the grill and they’ll go soft and juicy, a little bit charred and you can peel of the skins easily. Alternatively you could just do what I did and buy them in a jar preserved in oil. They make a good starter when stuffed with cheese and herbs or are great contribution to any antipasti platter as well as being a great quick and easy ingredient in salads. I was a little worried the beans would be to bland and began to consider what I could season them with, but the saltiness of the halloumi alongside the sweetness of the peppers balanced the whole thing perfectly and any additional seasoning would probably have overpowered the whole thing. As always with my lunch boxes I’d advise you mix and match what you’re putting in and use this merely as a guide, but when you’re using lots of beans, make sure the other ingredients add enough variety of flavour, if not then be generous with your seasoning, a nice sprinkle of mixed herbs and paprika with a dash of salt and pepper wouldn’t go amiss. Obviously when making this lunch you’re going to be opening several tins of beans in one go which is way too much for your lunchbox, unless you’re making for the whole family. To store the remainder of each individually in the fridge would use up a million jars/tupperwares, and I cannot stress enough that you should NEVER EVER store opened tins in the fridge as it’s really unhygienic. 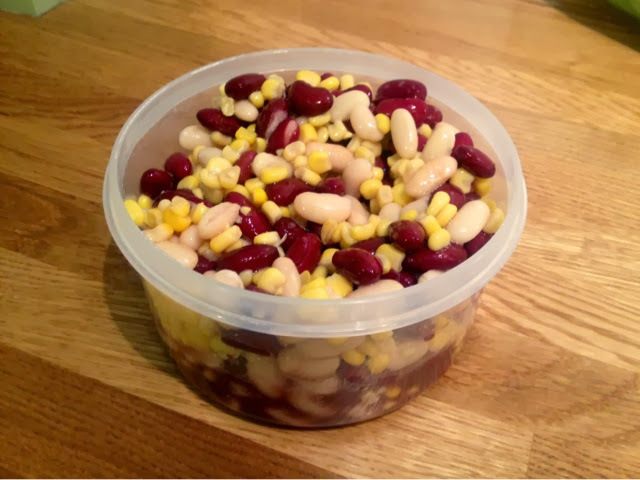 To get around this problem, I like to create a ‘bean mix’ at the beginning of the week which can be used over several lunches and can be mixed together with different things to make different lunches. These could be used the next day for a tuna and bean salad for example. They don’t even have to be used for lunches, the rest could be put into tomorrow night’s stew, in a chilli con carne, or be used to make a soup later in the week.